Instead of learning just enough Web skills to be dangerous, let us implement your site quickly, so that you can apply your time to your content. Our approach is to emphasize functionality and rock-solid navigation within your site, followed by customization and refinement of appearance. Prepaid price approximates a fifty percent discount from our à la carte price list. This program does not include content management such as composition, graphic manipulation or posting text. Clients agree this is our most cost-effective service for basic websites. You gradually take on only those tasks you choose. We help as much as you choose. Hosting for the first month is included in the startup. Hosting and technical support plan starting at only $10/month*. Creative services are priced separately. You control your cost: no new hardware, software or staff. implementation under $500, compare to handcrafted sites costing thousands. 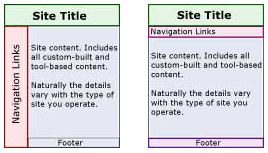 Choose a flexible template with vertical, horizontal or hybrid navigation layout to start; revise later. Many available, not shown. Choose an initial color scheme. You will have full control of backgrounds, text, etc. Start fast by adopting one of our standard layouts; apply your own color scheme. Gradually substitute a custom design at your own pace. Our platform offers numerous tools to simplify creation and editing of popular website features. Directory (think Yellow Pages) of strategic partners, suppliers, etc. : Install and train, add $150. Expanded Hosting Package: $49/month billed to your credit card includes 1 gibabyte of storage. You supply text and graphics; most clients start with materials from other media like letterhead, brochures, logos, product descriptions and images. We use an online meeting by appointment to configure your site. Choose your own color scheme. Use a preconfigured theme or show us examples of sites you like and let us adapt a design - all in real time. Plan on two sessions of one to two hours each. Your Clark IP design affiliate will turn your existing materials into a website. First we make it work; then we make it pretty. If you do not have standard content, original creative services are available; additional features are available in our Professional, Enterprise and Journalmaker packages or by individual arrangement. Delivery time can be just a few hours but is normaily a few days from the moment we have your source materials (text, graphics, product list...). Your pre-payment puts your project in our service queue. Discuss the schedule with your account representative before purchasing. Your payment is non-refundable once work has begun. You can modify the appearance of the site at any time using a standard theme, or you can use the automated appearance tools, or one of our designers can alter it at low cost; minor appearance adjustments and advice are free. Once your site is operational you can pick and choose additional services as needed, or just add content within the structure. *Basic hosting and technical support package prepaid annually at $99 billed to your credit card. Includes one megabyte of storage. Does not include content management (writing, posting, editing). *Expanded hosting and technical support package prepaid monthly at $59 includes 5 gigabytes of storage. *Writing, graphics and other content service are available at rates published elsewhere on the site.